You are probably popping POPs (per-sistent organic pollutants) with your fish oil supplements; and even if your blood lipids would suggest the pills are helping, you may slowly, but progressively be running down your anti-oxidant defenses. In fact, scientific studies show that the consumption of fatty fish and fish oil supplements is an important point of entry of POPs into the human food chain, exposing populations to toxic compounds such as polychlorinated biphenyls (PCBs) and organochlorine pesticides (OCs). In that, Contamination with POPs in fish is not limited to certain regions or species. It is, rather, global and ubiquitous. 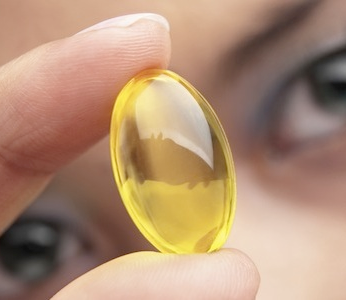 Fish Oil Makes You Rancid? PCBs were originally used as lubricants and cooling liquids for transformers, but their production was ceased in 1980 (Ortiz. 2011). Despite termination of their manufacture, PCBs still persist in the environment today and pose a threat as a toxic component in fish or contaminated fish oils. Clinical manifestations of PCB toxicity include endocrine, neurobehavioral, and developmental disruption (Marti. 2010). Organochlorines, another class of chlorine-containing organic pollutants such as dichloro-diphenyltrichloroethane (DDT), may also lead to endocrine disruption and pose a substantial carcinogenic threat (16). Previous studies have documented substantially increased breast cancer risk associated with PCB and OC concentrations in serum and breast adipose tissue (Aronson. 2000, Cohn. 2007). "Given these concerns, there exist debates weighing the potential risks from POP intake against the benefits of n–3 FA consumption (19–23). A few studies examined the risks and benefits of consuming fish and fish oil containing POPs with the use of animal models (24, 25). However, no such study has investigated the effects of fish oil contamination with POPs on CVD risk factors. Therefore, we sought to investigate the effects of POP exposure through fish oil consumption on certain biological functions, including serum lipid modulation, oxidative stress, and inflammation. We hypothesized that the fish oil contaminated with POPs would negate the benefits by increasing oxidative stress and inflammation and decreasing antioxidant concentrations" (Hong. 2015). To test this hypothesis twenty eight-day-old male Sprague-Dawley rats (n = 30) consumed diets of unmodified fish oil (FO) consisting of 15% fat by weight, persistent organic pollutant–contaminated fish oil (POP FO) (PCBs at 2.40 mg/g; OCs at 3.80 mg/g FO), or corn oil (control; CO) for 9 wk. How can you protect yourselves? The easiest, but not exactly cheapest option is to buy molecularly distilled fish oils from which the producers have (hopefully) removed most of the pops. Since there's a reduction dependent loss of nutrients like vitamin D, E, K, cholesterol and unsaponifiable compounds (Oterhals. 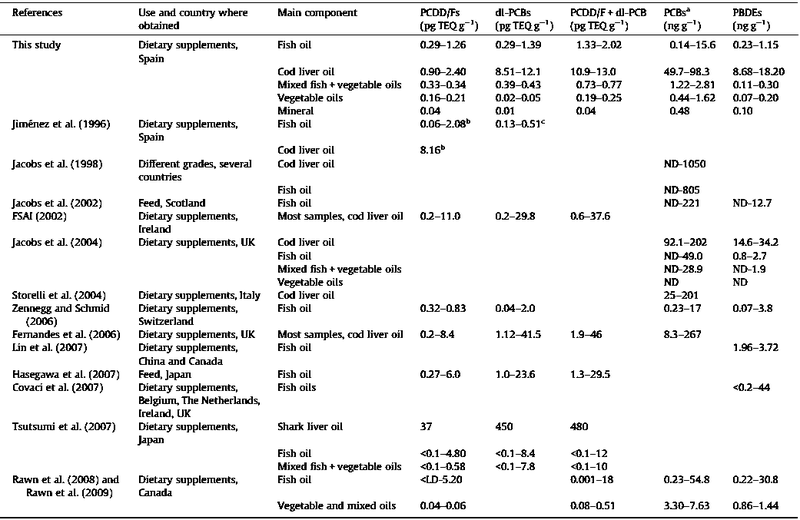 2010), not all "distilled" fish oils will be 100% POP free, but the amount should be low enough to minimize the risks. Addendum: Just because people asked me: Products with the PuriMax (TM) Logo as they are sold by one of Europe's largest bulk suppliers are molecularly distilled. Lipid profiles and C-reactive protein concentrations were assessed. Hepatic gene expression related to lipid metabolism was determined by real time quantitative polymerase chain reaction analysis. Figure 1: In spite of the significant increase in POPs in the adipose tissue of the animals (left), there were still significant improvements in blood lipids (right | Hong. 2015). After 9 wk of feeding, accumulation of PCBs and OCs in the fat tissue of the POP FO group compared with the other 2 groups was confirmed (P < 0.01 | see Figure 1 (left)). In spite of the ongoing intoxication, though, the provision of fish oils showed the usual effects on HDL, trigs, LDL and CRP, with the former being increased and the latter being decreased. Unfortunately, the POP FO group also exhibited a highly increased lipid peroxidation (5.1 6 0.7 vs. 2.9 6 0.9 and 2.6 6 0.6 mM) and a significantly reduced less antioxidant capacity (0.08 6 0.06 vs. 0.5 6 0.1 and 0.4 6 0.1 mM) compared to those rodents who consumed the corn oil and the purified fish oil diets (P < 0.05). 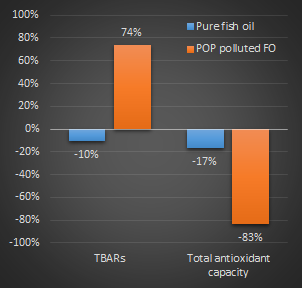 Figure 2: Relative difference of TBARs (marker of lipid peroxidation) and total antioxidant capacity in the two fish oil groups compared to that of the rats receiving corn oil (Hung. 2015). So what? In view of the fact that the levels of PCB, DDT and chloradane had been specifically chosen to mirror the concentrations of these compounds in commercially available fish and fish oil, the results of the study at hand are disconcerting. Before further research quantifies whether the observed toxicity is mediated by other markers (e.g., IL-6, TNF-a, serum amyloid A, or fibrinogen) and investigates potential long-term effect, it is yet difficult to judge the real-world significance of these results which stand in contrast to the proven (and eventually still existing) cardio-protective effects of fatty fish and fish oil (Harris. 2008). And still, the authors of the study at hand are perfectly right, when they point out that "the current results prompt caution in their consumption" (Hang. 2015). "For instance, research into the effects of different doses of contaminants and feeding durations is essential for the evaluation of long-term exposure and assessment of a critical window of exposure. In particular, the high accumulation of PCBs and OCs in the fatty tissue of the contaminated fish oil group raises concerns surrounding a generational effect through maternal transfer" (Hong. 2015) | Comment on Facebook! Aronson, Kristan J., et al. "Breast adipose tissue concentrations of polychlorinated biphenyls and other organochlorines and breast cancer risk." Cancer epidemiology biomarkers & prevention 9.1 (2000): 55-63. Cohn, Barbara A., et al. "DDT and breast cancer in young women: new data on the significance of age at exposure." Environmental Health Perspectives (2007): 1406-1414. Harris, William S., et al. 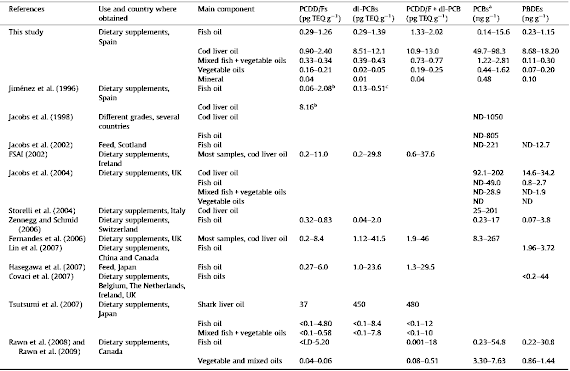 "Omega-3 fatty acids and coronary heart disease risk: clinical and mechanistic perspectives." Atherosclerosis 197.1 (2008): 12-24. Marti, M., et al. "Persistent organic pollutants (PCDD/Fs, dioxin-like PCBs, marker PCBs, and PBDEs) in health supplements on the Spanish market." Chemosphere 78.10 (2010): 1256-1262. Ortiz, X., et al. 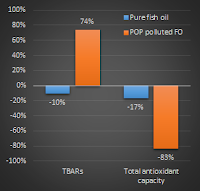 "Elimination of persistent organic pollutants from fish oil with solid adsorbents." Chemosphere 82.9 (2011): 1301-1307. Oterhals, Åge, and Marc HG Berntssen. "Effects of refining and removal of persistent organic pollutants by short-path distillation on nutritional quality and oxidative stability of fish oil." Journal of agricultural and food chemistry 58.23 (2010): 12250-12259.